Are you involved in the hotel, motel or hospitality industry? Don’t lose sight of the opportunity to benefit from repeat clients! It can be difficult to know how to get your accommodation business out in the public arena, all the while trying to attract repeat clientele. Luckily, we’ve got the very products you need to make a difference! When you’re looking for out-of-the-box promotional products that will be both functional and effective for your line of work, look no further than personal printed products from Conference Product Experts. We understand that personal hygiene and staying comfortable while travelling is key, so we offer the opportunity for hoteliers and other accommodation providers to delve into a rarely-tapped market. From body lotion, body wash, shampoo and conditioner, through to mirrors, nail files, sunglasses, combs and dental floss, there are very few personal products we don’t have and can’t brand! 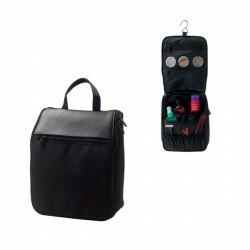 In fact, we can even assemble small hygiene kits that are perfect for businessmen and women on the go. Let your branding travel everywhere with your client! Whether you’re offering complimentary personal products within guest bedrooms, or you’re advertising your accommodation at a tradeshow or conference, you’re sure to benefit from printed personal products. By investing in items your customers can pick up and take with them, you’re opening the doors wide open to repeat business the next time they grace your town. Why use generic brands when you can customise products to represent your business? Get in touch and find out how we can provide you with the ultimate form of branding. 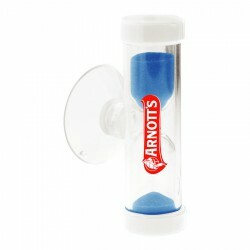 Minty fresh promotional breath spray in pocket sized atomiser spray. This custom printed breath spray uses a non-aerosol pump which is safer for the environment. Contains approx 7ml. Transparent (frosted) base and cap. Eco Friendly, Australian Made travel sized Shampoo packaged in recyclable PET packaging. Handy 36ml Travel Size. This custom imprinted shampoo is enriched with sea minerals, designed to refresh and uplift the body, mind and soul. Eco Friendly, Australian Made travel sized Body Lotion packaged in recyclable PET packaging. Handy 36ml Travel Size. This custom branded amenities range contains 100% Organic Australian Botanicals designed to refresh and uplift the body, mind and soul. Eco Friendly, Australian Made travel sized Body Wash packaged in recyclable PET packaging. Handy 36ml Travel Size. This custom printed amenities range contains 100% Organic Australian Botanicals designed to refresh and uplift the body, mind and soul. Eco Friendly, Australian Made travel sized Conditioner packaged in recyclable PET packaging. Handy 36ml Travel Size. These promotional toiletries contain 100% Organic Australian Botanicals designed to refresh and uplift the body, mind and soul. Eco Friendly, Australian Made travel sized Shampoo packaged in recyclable PET packaging. Handy 36ml Travel Size. This promotional amenities range contains 100% Organic Australian Botanicals designed to refresh and uplift the body, mind and soul. Branded combs. Every customised comb has the word unbreakable moulded right into the plastic. Made from strong, durable plastic that is sure to last the distance. 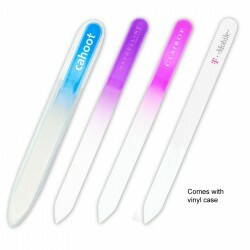 Promotional combs in matching vinyl sleeve, with bonus metal nail file included. Every printed comb has the word unbreakable moulded right into the plastic. Made from strong, durable plastic that is sure to last the distance. 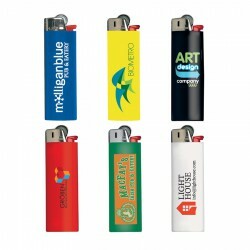 Standard pricing includes 1 colour print on comb or case, with option for print on both items for an additional charge. Printed advertising combs in matching vinyl sleeve. Every printed comb has the word unbreakable moulded right into the plastic. Made from strong, durable plastic that is sure to last the distance. Fragrance-free shampoo, the perfect unisex personal care or travel accessory. This custom shampoo comes packaged in a transparent, recyclable 50ml PET bottle with white pump cap. Fragrance-free Conditioner also available, see product COND102-c.
Fragrance-free shampoo, the perfect unisex personal care or travel accessory. This imprinted shampoo comes packaged in a transparent, recyclable 50ml PET bottle with stylish aluminium cap. Fragrance-free Conditioner also available, see product COND101-c.
Travel sized two piece joint-able toothbrush with Colgate toothpaste. A custom printed toothbrush is an excellent promotional giveaway for travellers and people on the move. Also great for oral health promotions and organisations. It's time to brush up on new ways to get your brand noticed. 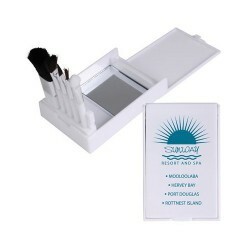 Travel size, joint-able toothbrush and paste set presented in white plastic box. 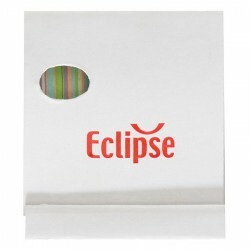 This logo toothbrush has a great decoration area on the casing for maximum exposure of your logo. Frosted Travel Toothbrush and Paste Case. Two piece plastic promotional toothbrush and paste case. Toothbrush and Paste inserts not included in standard pricing. Available in assorted colours only. Single coloured options not available from local stock. Eco Friendly, Australian Made travel sized Conditioner packaged in recyclable PET packaging. Handy 36ml Travel Size. These private label amenities are enriched with sea minerals, designed to refresh and uplift the body, mind and soul. Eco Friendly, Australian Made travel sized Body Wash packaged in recyclable PET packaging. Handy 36ml Travel Size. This custom imprinted body wash is enriched with sea minerals, designed to refresh and uplift the body, mind and soul. 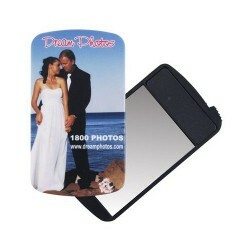 Stylish promotional compact mirror with flip-top case that acts as an easel when open. Silver plastic casing. This personalized pocket mirror is perfect for the office, the car or for travel. Fragrance-free private label conditioner, the perfect unisex personal care or travel accessory. Transparent, recyclable 50ml PET bottle with white pump cap. Fragrance-free customised shampoo also available, see product SHA102-c.
Fragrance-free personalised conditioner, the perfect unisex personal care or travel accessory. Transparent, recyclable 50ml PET bottle with stylish aluminium cap. Fragrance-free personalised shampoo also available, see product SHA101-c.
Standard promotional dental floss. This white plastic case has dental floss under the flip top. Waxed mint flavoured floss. This custom printed dental floss is approx 20 metre length. Tooth shaped promotional dental floss with keychain. This mini printed tooth dental floss has dental floss under the flip top. Waxed mint flavoured floss. Approx 10 metre length. 10 white plastic disposable dental flossers packaged in a clear, reusable vinyl pouch with handy beaded chain attachment. Extra hold branded hair gel, packaged into transparent, recyclable 50ml PET bottle white pump cap. Extra hold personalised hair gel, packaged into frosted 50ml tube with flip top cap. Extra hold promotional hair gel, packaged into 100g PET jars with white plastic cap. This logo printed hair gel has a great decoration area on the cap to give your logo maximum exposure. Refreshing promotional mouthwash. Available in three minty fresh colours. Custom printed mouthwash packaged in transparent, recyclable 50ml PET bottle with stylish aluminium cap. Eco Friendly, Australian Made travel sized Body Lotion packaged in recyclable PET packaging. Handy 36ml Travel Size. These promotional travel toiletries are enriched with sea minerals, designed to refresh and uplift the body, mind and soul. Frosted Travel Toothbrush Case. Two piece plastic promotional toothbrush case. Toothbrush insert not included in standard pricing. Available in assorted colours only. Single coloured options not available from local stock. Eco Friendly, Australian Made travel sized body lotion packaged in recyclable PET packaging. Handy 32ml Travel Size. The tropical range combines the wonderful scent of the tropics with the highly moisturising and enriching properties of Papaya extract and Coconut oil. Pill storage box features seven compartments. Each day of the week is conveniently labeled on the hinged, snap-up lid. Flip-top cover converts to mirror stand. The Sun Ray Sunglasses - Camouflage Rugged, camouflage-look classic folding eyewear. UV 400 protective lenses. 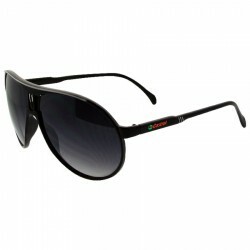 The Sun Ray Sunglasses - Tortoise Trendy, tortoise-look classic folding eyewear. UV 400 protective lenses. 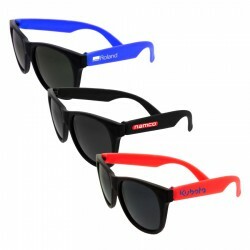 Patrol Sunglasses Classic folding eyewear. UV 400 protective lenses. Classic folding eyewear with clear lenses. Classic eyewear that folds into compact size for travel. Imprint available on glasses only. 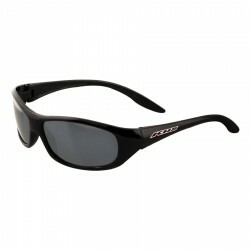 Fashion sunglasses with CE standard 100% UV 400 protection lenses. Eco Friendly, Australian Made travel sized Shampoo packaged in recyclable PET packaging. Handy 32ml Travel Size. The tropical range combines the wonderful scent of the tropics with the highly moisturising and enriching properties of Papaya extract and Coconut oil. Eco Friendly, Australian Made travel sized promotional conditioner packaged in recyclable PET packaging. Handy 32ml Travel Size. The tropical range combines the wonderful scent of the tropics with the highly moisturising and enriching properties of Papaya extract and Coconut oil. 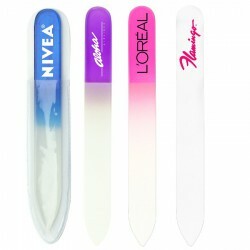 White plastic promotional comb. This is a handy pocket sized travel comb that makes a great accessory for the home, office, handbag or car. 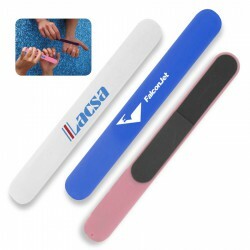 Promotional brushes are a great promotional product that will have your logo travelling far and wide. These travel sized brushes a great as a travel accessory and their natural timber finish will showcase your logo marvellously. A wooden hair brush custom printed with your company logo will also make a perfect gift for the home, office or car. Natural finish promotional timber mirror. A custom wooden hand mirror custom printed with your company logo will make a perfect gift for the home, office or car. 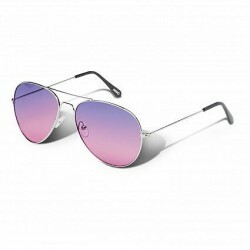 Aviator sunglasses with coloured lenses which fade from a darker to a lighter colour gradient. They have a metal frame and arms and are fitted with CE standard 100% UV 400 lenses which provide both UVA and UVB protection. A lead time of 10-15 working days applies to this product. 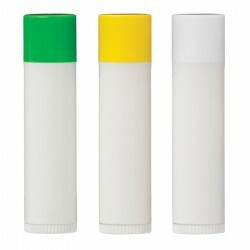 Up to 4 colours Available On Each Side Only (Warring Label on Side B) Up to 3,000 Lights! Comfortable to use Patented Child Guard Mechanism. Australian Made. 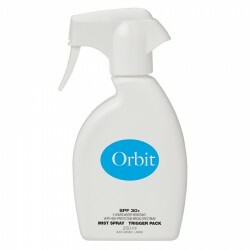 Sun protection - SPF 30+, Vitamin E, Butterscotch flavour. Glass filing surface, Never wears out! Handy and lightweight, Protective carry case included. Hang your handbag from any flat surface. Keep it off the dirty floor. Great accessory for out and about. Compact clam-shell design, Includes scissors, tweezers, nail clippers, cuticle wand and nail file. 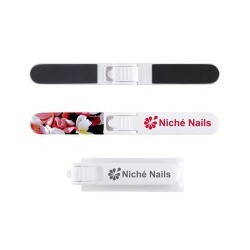 Hard case foldable nail file in pouch. 4 bladed fan with 2 file pads and 2 buffer pads. 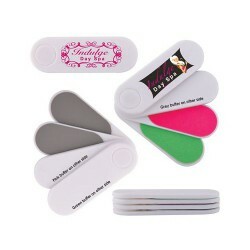 Shapes and smooths nails and fits neatly into your purse or pocket. Folding mirror & nail file in case. Compact pop up make up brush set with 5 brushes and mirror. Run this amazing massager over your head and body for an immediate pick me up. Ideal to hand out at conferences, events to involve participants in group action. 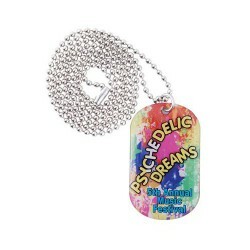 Epoxy domed aluminium dog tag with 76cm neck chain. Rounded ends. Printed 4 Colour Process front and Laser Engraved on back. Four prong massager with handle. 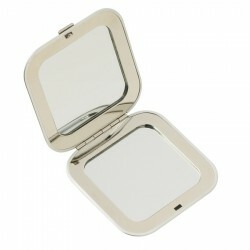 Metal case in brushed silver finish with normal and magnified mirrors. Supplied in black box. 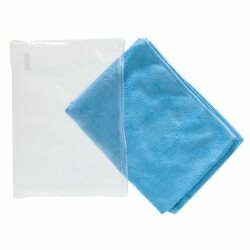 Super-absorbent microfibre towel features excellent water absorption and quick drying. 2 colours available. In opaque white tube in polybag. split leather and microfibre, zippered opening, outer zippered pocket on flap, inner zippered compartments and elasticised pockets to hold bottles, etc., carry handle & hanging hook. In deluxe 2 piece black gift box. Super absorbent microfibre towel for sport, camping or around the house. In zip lock PVC bag. 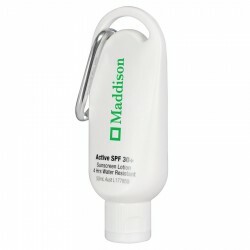 Australian-made and TGA approved, this smart looking Promotional 50ml Sunscreen with Carabiner is i or school bags. Suitable for the beach or outdoors. Screw top allows easy refilling. Features: cara protection sunscreen, water resistant for up to 3 hours. Keep this handy set of twelve mini emery boards in your hand bag or glove box for that broken nail emergency!. 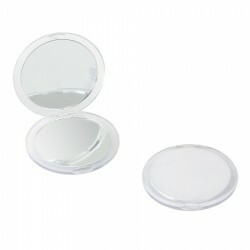 White plastic compact mirror consisting of one normal and magnified mirror..
Australian made, TGA approved, SPF30+, Water resistant 3hrs, Push action spray, Refillable. Australian made, TGA approved, SPF30+, Water resistant up to 2 hrs, 5g. Mini body scale that can carry up to 180 kg. Measures in Kgs / lb / St. Automatically switches off when not used. Features an alarm function for low power or overloading. Includes 1 x button cell battery. Tooth brushing timer with light to remind how long you should brush your teeth. 1 Minute interval. The product can be placed on the wall using the suction cup at the back of the product. Includes 4 x AAA batteries. 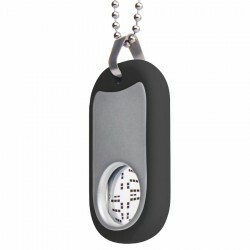 Fashionable dog tag with high accuracy digital quartz movement and silicon jacket including 'your time/my time' feature. Metal ball chain length 65 cm. 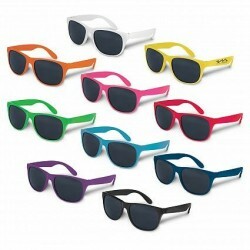 UV400 blocking sunglasses. Slim stylish metal frames. 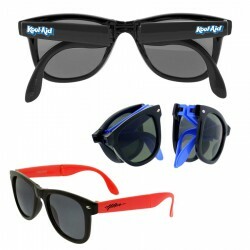 Features: Includes black hard-shell hinged protective case and cleaning cloth. Star shaped design enables you to fit one finger in each cup. Silver print recommended on Blue. Pantone Colours recommended on Clear. Special Transparent Colours available ex overseas factory minimum *5,000 units, delivery 10-12 weeks. 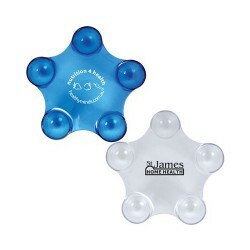 4 legged crouching man shape massager with 4 massaging points. Smiley face printed on front.